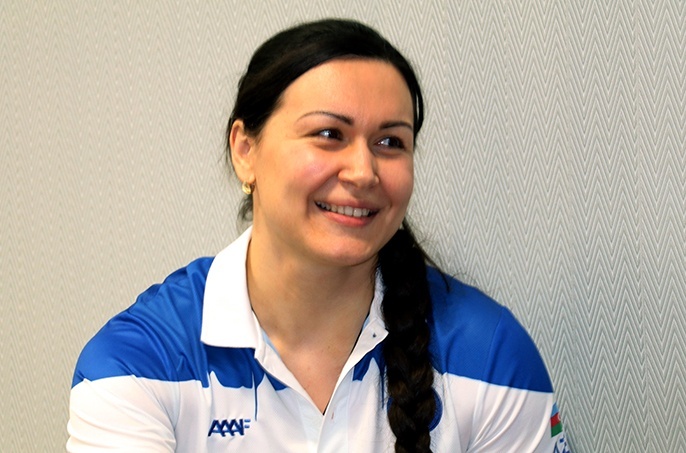 Home NEWS MEDIA Natalia Prishepa: "I want to bring up champions for Azerbaijan"
Natalia Prishepa: "I want to bring up champions for Azerbaijan"
The head coach of Women Weightlifting National team, as well as, the representative of “Zirve” International Sports Club and “Kishinyov-Zirve” athlete-Natalia Prishepa’s interview to aaaf.az. Natalia, you are here for more than half a year, you are managing women national team as a coach. How did you get an offer to work in Azerbaijan? Thank you. I have received a phone call and told me that the women’s coach is needed. The offer is very interesting. Just because I was preparing for the Rio Olympic Games at the time, I did not agree and asked to wait. 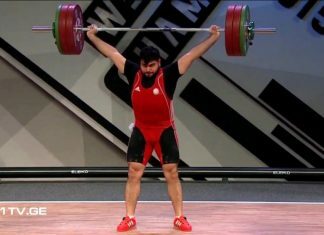 After Moldovian Weightlifting Federation informed me that I cannot go to Brazil (Later, two days before the Olympics, this decision changed and Natalia performed in Rio. ), I gave a positive response to the offer from Azerbaijan. How did you get the coaching offer when you were an active athlete? Good, because I wanted it. I like to coach. I had exercises for teenagers in the absence of Head Coach and I enjoyed it. That’s why I’m very happy with the proposal. The only disturbing thing was the language difference. Because it matters. I must speak and explain in their language when communicating with the athletes. It was difficult at first, but now everything is fine. I’m slowly learning. Yes, even if your language is difficult, I know it’s important to start learning from the first day. Now I understand the interviews by 40%, and I give the tasks in your language in the training. I respect Azerbaijan, its people, so I have to learn your language. We thank you. Before your assignment in Azerbaijan, you were also a sportsman in several competitions. The offer from here was not exciting? It was, actually. Because I suddenly thought I could not do it. But on the other hand I believed myself. If such people invited to me, and trusted me, it could not be bad. Thank goodness, everything is fine. What can you say about the progress of your work at the moment? We do the exercises regularly, the girls are preparing with great effort. Yes, it would be difficult. Girls are not fixed, there are difficulties in training. I myself am a woman, I understand them. 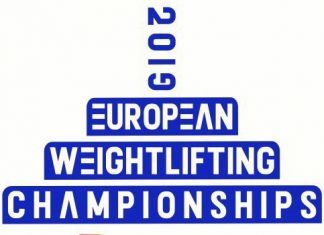 Almost in our national team, we have women athletes who promises great prospects in this hall, the future World or European Champion, European medalist? Yes, we have good potentially, strong-willed, ambitious girls. It seems that if they work on their own, they can win great victories. Coach job is also important. Because our young girls have technical deficiencies and mistakes. We’re trying to unite them now. Update the new technique is more difficult than implementation. But day by day, we are developing. I see the results and am happy for this. 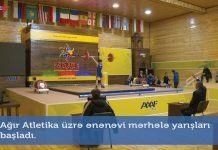 In March there will be Azerbaijan Championship, where you will all witness the progress achieved. It will take for some time. Of course, there will be consequences. But for this, the exercises must be intensify, and the duration must be increased. To my mind that we will get good result about 2-3 months. Yes. We won medals in European Championship ( among youth, teenagers),as well as, Islamic Solidarity Sports Federation Championship. Our woman athletes became the champions. The competition in Jordan was a good test for upcoming IV Islamic Games. 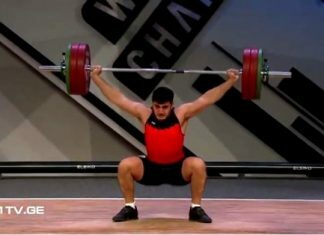 Generally, what do you think about Azerbaijan Weightlifting? There’s a lot of work on it. Although I am not very knowledgeable about our men team, I see that the direction is taken correctly. 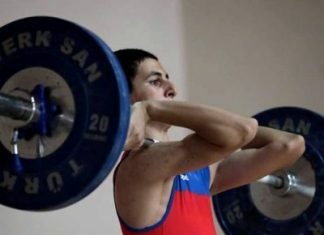 Now a new generation of weightlifters is growing. It is important that the attention is directed to this. Federation management is doing great work in this respect. I appreciate that, I try to give maximum support with my own business. What are the conditions created for the national team? Very good. I think it can not be more than that. Whether it is nutrition, exercise, or rest … In short, there is the best in every respect. It’s only for us to exercise, win. – You are in Azerbaijan more than half a year . Do you feel like “ours”? – I confess, I miss it. Maybe I’m the only one. But the staff are very friendly here and I have a good relationship with everybody. I think Azerbaijan is a very close country to myself. I can only say good things about your people. – What are your goals and objectives in this area? – As a coach I want to create a kind collective first. Apparently, I’m slowly getting this. Then I have to try to have a good technique of athletes, because this is very important. This is the main way of getting results. My first goal is to win a license to the Youth Olympic Games held in Argentina next year. 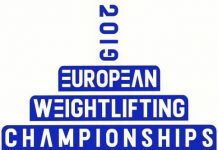 Then European and World Championships … In short, I want to bring up champions for Azerbaijan.